I’ll be digging through my family photo archives soon in search of a name for my next design, currently in the works. What I find there is always a surprise. 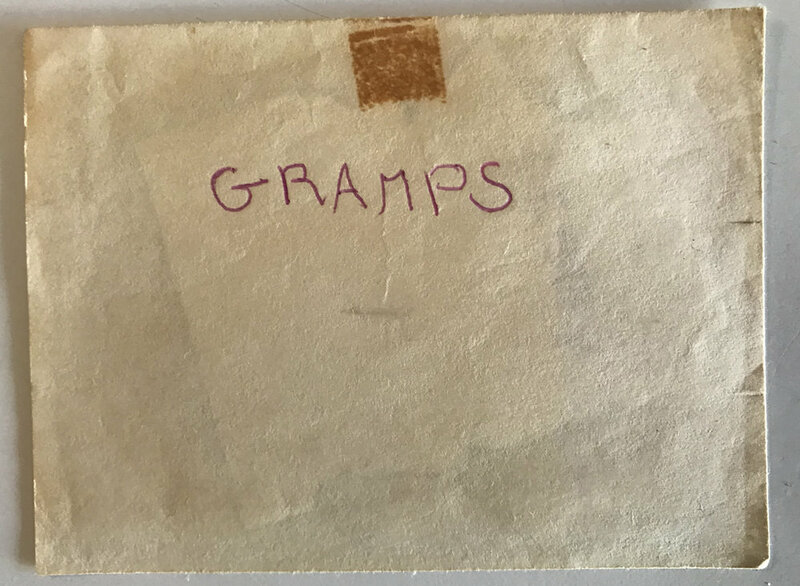 I wasn’t intending to post on my blog today, but on this Valentines Day something prompted me to take a peek into the folder labeled with my own name, where I discovered this small envelope, yellowed with age. I do love that Marlene saved things. This was my valentine to my grandfather Harold (Gramps – a name I gave him) Welch, c 1961. And since most of my posts highlight the women in my family due to my feminine knit designs, I’m pleased to take a moment and say hello to Gibby (soft G), as my grandmother Mildred called him – her rock of Gibraltar she was fond of pointing out, and that I love remembering. This was me then, posing in one of the few sweaters Marlene made for me, beside my parakeet Pete. Coincidences abound as I married Peter 18 years later – ya, not the parakeet :). Marlene and Harold (Gramps, Gibby). Sometimes brushing my teeth in the morning I see him looking back at me. Marlene and I tend to favor his lineage. It’s usually a sign that I should get my eyebrows done – reported lovingly. Happy Valentines Day Harold-Gramps-Gibby. I’m thinking of you. “Jack might like a hat,” she said, when I asked about gift lists for the babies. And of course, Jack’s (and Juliet’s) wish is my command. But since I’m not a hat wearer, I rely on others to show me the way. Thank you Gabrielle Danskknit for your The Journey of the Aviator design. I aim to always have something ready to knit. It's embedded in our routine, mine and Doug's – during morning coffee in front of the news and at the end of the day, as you can see. So when a design is launched without the next yet coming into view, I look for something simple but meaningful to bridge the gap. This last time, the filler became my Happy Thought cowl – named for an optimistic, one line poem I found in my tattered copy of A Child's Garden of Verses, a gift from great aunt Lillian Hildegarde, on my bookshelf since day one. I can be a color coward, I admit it, and this proved true again with my recently published Lucy cardigan. I loved the blended Juniper Moon Farm Moonshine yarn and had been drawn to their Sun Haze color, but in the end I caved, settling instead on the still lovely but less adventurous Moonbeam. So, with golden color beckoning, and seizing my chance at redemption while still noodling indecision about my next something, I recalculating stitch and row gauges accordingly, for this – version 2. Meanwhile and finally, I was making good progress on a new design. It will be a textured cardigan using Quince & Co's worsted-weight, blended, Owl yarn in Cielo – an inspiring light blue. So, while waiting for mail order delivery, its sample skeins on hand for gauge testing became this – version 3. A perfect designing segue, I'd say, and a win-win-win for me and Doug. I'm excited to report that my new textured cardigan – dubbed Listening to the Robin's Song – is nicely underway. I'm hoping that Cat Stevens won't mind the reference. EPD (estimated publishing date) is expected sometime in April. I'll post and tweet upon its release. Update – Listening to the Robin's Song published 4/21/2017. My design ideas have been coming up in pairs lately, where discoveries made in the first spawn revisions and additions in the next. And although I do enjoy the opportunity to go back at the math and construction in a second go-round, I admit that it hadn't been my initial plan. It's just what happened along the way and accounts for the lame naming of Brooklyn2 following the previously published Brooklyn – alas. So when I saw it happening again in my current design duet I decided to get out in front of it by determining a family sourced name pair from the start. This is a favorite family photo – my parents, Bern and Marlene on the left, with my aunt Kay and uncle Clem (aka Junior or Luke) at a night club somewhere. I enjoy this point-in-time glimpse into their lives, and imagining them then. It's 1951, Marlene was 20 and working full-time at a Boston insurance company. They married the following year. I remember Dad would happily recount how she'd laugh out loud watching I Love Lucy on TV during those years and I like to think of that. Watching those early episodes gives great insight into the society of the times and the roles of men and women – a time when a clear hierarchy existed between the sexes. During those years most women gave up jobs and became homemakers after marriage, but Marlene wanted a career. So bucking the tide and amidst some gossip (I'm told), she continued working. By the time of her retirement years later she had become a beloved fixture and integral member of the staff of the Harvard Athletic Department. I know she never felt that she had achieved the career status she wished for, but she was definitely ahead of her time. I hope she found pride in that, and for being a terrific role model for me – this yet another in the myriad of things I should have told her. Lucy and Ethel – 2 button-less garter stitch cardigans with shrug and wrap-around variations – are currently underway. Updates to follow. Update – Lucy published 2/22/2017 followed by Ethel on 3/1/2017. The name of my latest design (almost literally) fell into my lap as I was working with Mum's postcards. While sorting through I found this one among them – a message from then teen-aged Marlene, writing home to her family. Always on the lookout for a family story to apply to my knits, the irresistible Miss Me Yet became its name even before any of its design details came into view. Then most of these came easily too. And that never happens. Still swooning over the quince & co. cotton yarn I used for the remake of May, the single skein remaining from that project called to me. I ordered more and Miss Me Yet used up every last bit. Juliet's Openwork Mitts spawned its lace. The stitch count repeat in multiples of 6 was easily translated to the rib trim variations of its hems, pocket tops, and button lap, and provided elegant hiding places for the invisible shaping of its bodice. Knit in the round, from the cuffs up, I worked out something entirely new while shaping the sleeves. Increasing only 1 stitch on the round instead of 2 eliminated the visual jog, spiraled nicely, and was an easier story for knitters trying to follow my directions – something I value as much as the design itself. The stitch pick-up count of a button lap is often more science than art. Too many stitches and it bulges badly, too few and it pulls upward. Aiming at just right I had the additional self-imposed mandates of a count that was divisible by 3 (to match the rhythm of the lace) plus 2 more (for a clean edge), and 4 buttonholes that needed to be spaced evenly from v-neck base to hem. In addition to all of this, but held on the way-back burner for the moment, was my wish that as the 3x3 ribbing joined with the back neckline, its sequence would match the pattern of the stitches that were held there. Too much to ask? Mathematically possible, but in my experience, unlikely – and yet all of this, including the long-shot of the back neckline segue, worked out on my very first try for all 7 sizes. Serendipity? Sure, but in this case I prefer to employ a bit of magical thinking. 8 glorious test knitters from New Jersey, Texas, Washington, Denmark, Germany, and India are working as I write this to prove out my calculations and check my text. I'll plan to publish in late April once they're done. I have a good feeling about this one, an angel on my shoulder. And to answer the question posed by its title – yes, Marlene, we surely do. Update – Miss Me Yet published 4/23/2016. Among several tasks on my excellent, new, to-do tracking system for last week, there was only one real priority – to re-publish my May design (that I posted about a few weeks ago in Catching Up). The task seemed do-able. It's true that what started out as a simple rewrite to modify yarn and add metrics had taken a turn when I decided to redevelop it to be knit in the round instead of flat and embed its shaping invisibly inside the cable stitch pattern instead of at its edges. Then the gauge of my new yarn, Quince's cotton Willet, turned out to be slightly different than its obsolete predecessor and required a bunch of recalculations. But by now I had made great progress on the bodice, and had only to trim the neckline and work the ever-so-short cap sleeves. Then I'd be done. Re-publishing within the week seemed do-able and I would happily check this off of my list! Cotton is less elastic than wool, and because of this, I found out, tends to be less forgiving in some aspects of sweater-making, such as picking up stitches along the deep v-neckline of May for its rib trim. The stitch counts my calculations told me I needed left noticeable gaps, and after a few trials I determined that the problem lay in the absence of a selvage along this neckline. Since the v starts below the armholes and the piece is knitted bottom-up and now in the round, this remedy required both sides of the bodice front and its back to be unraveled down to this start point. I took a breath, did this, and began again. After 2 days of re-knitting, with my neckline now complete with selvage, I gave it another go – with the same disappointing result, unfortunate gaps along the pick up edge. I took a few more breaths, (I did breathe in between these trials, but hardly), unraveled for the second time, re-knitted it as it was, and while I was doing so thought hard about another solution. In my third attempt, I tried a method I'd read about but hadn't used before. With smaller needles I picked up a stitch in every row along the front v edges – many more stitches than I needed, but with no gaps. On the trim round that followed where I introduced the knit 1, purl 1 rib, along these front v edges I modified the sequence as knit 1, purl 2 together to decrease these extra stitches away. Finally, success! 4 days later.. so much for planning. Among several tasks on my new to-do tracking system for this week, there is only one real priority – to re-publish May. The task seems do-able. Update – revised May finally re-published 1/15/2016. so, ya, my bad – until now. As I've written previously, I'm driven (since working with quince&co on Linda) to update my patterns with metrics and Quince's formatting terminology and language. Starting with my early designs (first public offerings in 2010-11) this review sometimes goes beyond the surface and I find myself tweaking other things. The latest in my revision queue is May. May was designed with Classic Elite's Wool Bam Boo (50% Wool, 50% Bamboo), my go-to yarn at that time, that has since been discontinued. So embedded in this task is an opportunity to try something new. Juliet's birthday gift to me this year was a gift certificate to quince&co. Starting there and checking for comparable gauge I discovered their Willet, a sport-weight cotton. I find it thrilling that they are environmentally conscious, and this cotton yarn, billed as cleaner, is also quite lovely to work with. I'm swatching now for my revised May to be followed next by pattern #128, as yet unnamed but with design coming into focus. More to come, sooner than the last round. I promise. Well aren't I a lucky duck! Here's a screen shot peek. Hope you'll check out the full blog post here. When I was 8 I had a birds egg blue vinyl spring jacket – that may or may not be the one pictured below, but no matter, close enough. And through the magic of photoshop it now is. Aren't so many of our selections in life based on memories from the haze of childhood. It's my recollection of this vinyl jacket that has prompted my design currently underway – a garter stitch cardigan made from Quince&Co's lark wool in birds egg blue. Zippered instead of buttoned and a bit more hip, I like to think, but its essence is surely this. And it's almost done, just in time for spring. I'll post soon. I decided to set my own design work aside for these last few weeks in December, needing some last minute and thoughtful gifts. Hats – quick – seemed just right. I know nothing about hats. I don't wear them and therefore don't understand their fit and form – a perfect opportunity to try out the patterns of another designer whose work I follow, Amy Christoffers of Savory Knitting. It's nice to let someone else do the thinking for a change and I think I'll defer to Amy for all things hats from this day forward. I've been having a grand time with Lazy Jacks Hat (2 finished above) and Cider Press Set (currently on the needles), all worked in Madelinetosh Vintage wool – another first for me. I'll finish all 4 in plenty of time for our gift giving dinner. I'm working 2 designs at once these days. One on the needles, and the other, at this moment, on paper. Not something I usually do. The over-sized cowl/wrap (on the needles) is taking very little attention – perfect for tv knitting at the end of the day – while the other, a zippered cardigan, is taking a whole lot, as I'm working the math and drawing. All together an ideal pairing I'd say, much like my partner Douglas and me. Initially I thought they might look cool paired, but after swatching I found the open version more appealing so I stuck with it. at first glance almost colorless in its pale-ness, but while working it has become nicely saturated. It feels quite rich to me by now, and a favorite. Also note, I'm tweeting!, turned on to twitter by Juliet who found, to my delight, that fellow tweeters were mentioning my designs. For those of you who tweet too, you'll find me there as @DebHossKnits. I hope you'll follow me as I post regular updates about my knitting progress, and maybe a bit more. I can never forecast which design will be popular and which will not. I hold my breath, hit publish, and see what comes. And though I love them all, some clearly do better than others. Happily, it's now apparent that my June offering – Marjorie – launched yesterday, is a hit with my fellow knitters on ravelry! What a thrill. I'm not even trying to wipe the smile off of my face. Thank you knit pals! You'll find the pattern for marvelous Marjorie on ravelry and now on craftsy too, with additional information available here. Last month I was delightfully surprised to find my Mary design included in the Patternfish Newsletter. The resulting increase in blog traffic and pattern sales following that post was dizzying! and made me realize the value of this outreach. And so it's been with renewed motivation that I've spent the month of May designing and preparing submissions to online and print publications in the hopes of making an appearance one day in their pages. I have no illusions about the likelihood of acceptance. I understand that it's a bit of a lottery driven by many factors I can't predict or control. Its risks are few – some weeks of invisibility maybe as I put my self-publishing aside, and the potential of a bruised ego if/when my submissions are rejected – while its ultimate benefit, if designs are accepted, is great. What I didn't anticipate however, were the benefits of the process. I'm on the mailing lists of Interweave Knits and Twist Collective and receive notice when submissions for future issues are being accepted. Mood boards are included highlighting required styling themes. As luck would have it, notices for winter 2013 and spring 2014 issues came in at the same time of my Patternfish epiphany, so I was more than willing to see how I could fit. One of the themes for Knitscene spring 2014 (a production of Interweave Knits) was Black and White. I'd been working with color blocks lately so it seemed a go. My favorite yarn supplier, Quince&Co, didn't have a white that was white enough, so I went on an online search and discovered a bright white in a wool I'd not used before, Cascade 220 sport, in my favored gauge. (Canadian readers will find Cascade 220 sport here.) I found a supplier in a local store, Gather Here, that I had been meaning to visit for a while. It turned out to be quite a treat and I've been back a few times since. I suggested this same bright white for my Twist Collective winter 2013 submission, a match to its icy winter photo collage style sheet. Candy Box was one of the requested themes for Interweave Knits spring 2014, aiming at feminine colors and lace. I felt that this too would work for me. In a whitknit.com blog interview I'd come across recently, Pam Allen mentioned Susanna Lewis’s Knitting Lace as a book every knitter should own, and now I do. It's this book I mined for my candy box lace, along with the previously untried Quince color of Dogwood, a luminous pink I now swoon for, and that is now on my needles for my next project as well. So with all submissions made by their respective deadlines I'm back to my own design stream, armed with new wool, new colors, new lace, a new store, and 3 new fleshed out designs that I'll publish myself if the responses come in as "thank you, but no." It's all good. I'm going with the flow. I'm aiming at a new pattern launch later today (and cannot wait! ), but for now offer this sneak peek – with our little friend. Winter's here so photography can be challenging. I decided to give interior shots another go. Following is Anne underway – a delightful sweater vest. The belt was a Christmas gift from Juliet. Its yellow is the same as the flecks in Brooklyn Tweed's Shelter wool, colors Sap and Foothills – the reason they worked well together and the reason I chose them for this project. How did she know? Pattern release forthcoming. Stay tuned. My foray into a gift-worthy knit this year has turned into a thesis – my cowl thesis! And as long as I stay within gift giving deadlines, an enjoyable one at that. I don't typically wear cowls so exploring their variations in dimension, fit, and fabric drape has created a bit of a research project for me. All versions have their lace in common – flame chevron – named appropriately I'd say for taking the chill off. This stitch pattern is shown above worked in Baby Alpaca DK (green tea) by Shibui Knits and Lark (frost) by Quince & Co. And just to prove my mettle, I've worked another, not shown, in Quince & Co's Chickadee! The piece I'll gift is slowly coming into focus and will require a 4th version, slated to be on my needles today. I plan to offer them all as a set in a single pattern – soon – for other knitters to enjoy. I decided to try something new. Brooklyn Tweed puts out a very cool set of Look Book Collections so I ordered a skein of their Shelter wool in color Sweatshirt. I'll admit that its name had a lot to do with my selection, for some reason bringing me back to Sky King on Saturday mornings after swimming lessons when I was eight – oy. The wool proved to be in keeping with its name so I've been working a correspondingly cozy design in my head with this wool, while actively knitting Terasa (below) – a 2 color cardigan worked in seeded rib check, the same stitch pattern I used with Amelia. Terasa, now happily done, was fun to make and I'm pleased with the resulting fabric, fit, and colors! I used Quince Chickadee wool in marsh and crocus and I think they bring out the best in each other. Hope to have this pattern posted by tomorrow, I'll be working on it next. Slow and steady wins the race, or at least eventually completes the sweater! Here's Amelia, underway, with supervision by my pal, Doug. Amelia – luckily she has no deadlines (besides those that are self-imposed) as I've knit, assessed, ripped, and knit again. I've learning quite a lot during these trials, so it's all good. This is how she stands now. Circular knitting has been replaced with straight since shaping with the seeded rib check stitch pattern appeared awkward rather than decorative. A purposeful seam will put all that to rest. And there's been lots of decision-flux with the contrasting waistband during these past few weeks – that I finally settled on keeping. I would have belted it anyway, so why not? Its color will be repeated in the sleeves and collar, creating balance. So, with these hurdles overcome, I believe we have lift-off! Doug and I are settling in for a day full of knitting – happily. I wish I had something more to show of my work for the past several weeks. The truth is I have been working, on Amelia – but there's been some trial and error. This is the piece I put aside for Katherine and my Dorothy remake, the one I've been mulling over for several months by now after spying the color-block on a tv newscaster one morning during breakfast. I'm finally back to it. In its current state – here's a peek – you'll find my original plan for garter stitch replaced with seeded rib check. I'm using Quince&Co's finch wool in 2 colors: the very luminous frost, and its darker counterpart, storm. Today I'm scrambling toward the waistline, excited (and a little anxious) to introduce the second color. I can't wait to see that.